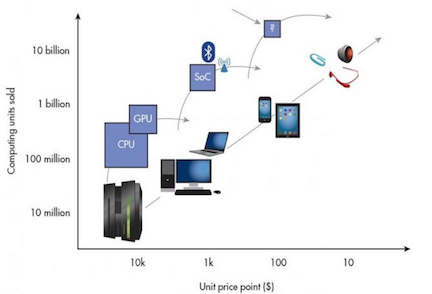 The computing industry progresses in two mostly independent cycles: financial and product cycles. There has been a lot of handwringing lately about where we are in the financial cycle. Financial markets get a lot of attention. They tend to fluctuate unpredictably and sometimes wildly. The product cycle by comparison gets relatively little attention, even though it is what actually drives the computing industry forward. We can try to understand and predict the product cycle by studying the past and extrapolating into the future. Tech product cycles are mutually reinforcing interactions between platforms and applications. New platforms enable new applications, which in turn make the new platforms more valuable, creating a positive feedback loop. 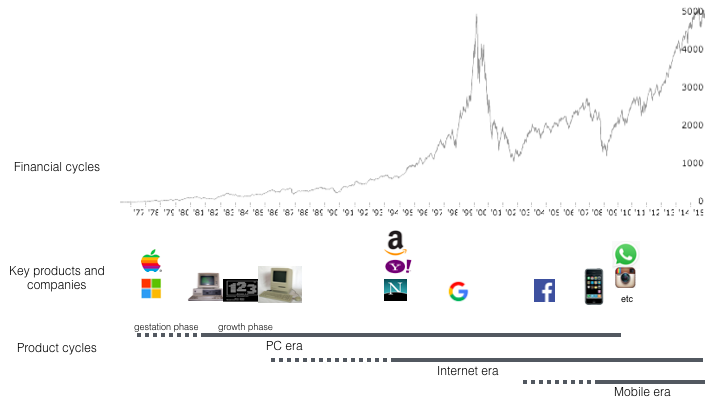 Smaller, offshoot tech cycles happen all the time, but every once in a while — historically, about every 10 to 15 years — major new cycles begin that completely reshape the computing landscape. The PC enabled entrepreneurs to create word processors, spreadsheets, and many other desktop applications. The internet enabled search engines, e-commerce, e-mail and messaging, social networking, SaaS business applications, and many other services. Smartphones enabled mobile messaging, mobile social networking, and on-demand services like ride sharing. Today, we are in the middle of the mobile era. It is likely that many more mobile innovations are still to come. Each product era can be divided into two phases: 1) the gestation phase, when the new platform is first introduced but is expensive, incomplete, and/or difficult to use, 2) the growth phase, when a new product comes along that solves those problems, kicking off a period of exponential growth. The Apple II was released in 1977 (and the Altair in 1975), but it was the release of the IBM PC in 1981 that kicked off the PC growth phase. The internet’s gestation phase took place in the 80s and early 90s when it was mostly a text-based tool used by academia and government. The release of the Mosaic web browser in 1993 started the growth phase, which has continued ever since. There were feature phones in the 90s and early smartphones like the Sidekick and Blackberry in the early 2000s, but the smartphone growth phase really started in 2007–8 with the release of the iPhone and then Android. Smartphone adoption has since exploded: about 2B people have smartphones today. By 2020, 80% of the global population will have one. If the 10–15 year pattern repeats itself, the next computing era should enter its growth phase in the next few years. In that scenario, we should already be in the gestation phase. There are a number of important trends in both hardware and software that give us a glimpse into what the next era of computing might be. Here I talk about those trends and then make some suggestions about what the future might look like. In the mainframe era, only large organizations could afford a computer. Minicomputers were affordable by smaller organization, PCs by homes and offices, and smartphones by individuals. We are now entering an era in which processors and sensors are getting so small and cheap that there will be many more computers than there are people. There are two reasons for this. 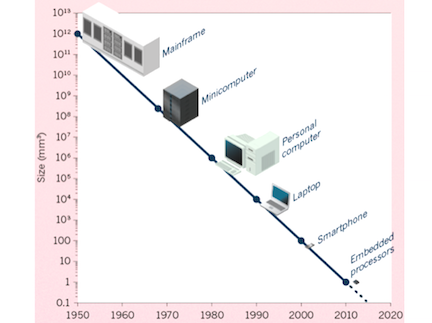 One is the steady progress of the semiconductor industry over the past 50 years (Moore’s law). The second is what Chris Anderson calls “the peace dividend of the smartphone war”: the runaway success of smartphones led to massive investments in processors and sensors. If you disassemble a modern drone, VR headset, or IoT devices, you’ll find mostly smartphone components. In the modern semiconductor era, the focus has shifted from standalone CPUs to bundles of specialized chips known as systems-on-a-chip. Typical systems-on-a-chip bundle energy-efficient ARM CPUs plus specialized chips for graphics processing, communications, power management, video processing, and more. This new architecture has dropped the price of basic computing systems from about $100 to about $10. The Raspberry Pi Zero is a 1 GHz Linux computer that you can buy for $5. 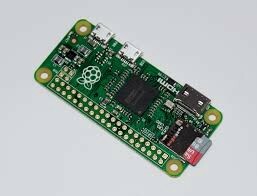 For a similar price you can buy a wifi-enabled microcontroller that runs a version of Python. Soon these chips will cost less than a dollar. It will be cost-effective to embed a computer in almost anything. Meanwhile, there are still impressive performance improvements happening in high-end processors. Of particular importance are GPUs (graphics processors), the best of which are made by Nvidia. GPUs are useful not only for traditional graphics processing, but also for machine learning algorithms and virtual/augmented reality devices. Nvidia’s roadmap promises significant performance improvements in the coming years. A wildcard technology is quantum computing, which today exists mostly in laboratories but if made commercially viable could lead to orders-of-magnitude performance improvements for certain classes of algorithms in fields like biology and artificial intelligence. There are many exciting things happening in software today. Distributed systems is one good example. As the number of devices has grown exponentially, it has become increasingly important to 1) parallelize tasks across multiple machines 2) communicate and coordinate among devices. Interesting distributed systems technologies include systems like Hadoop and Spark for parallelizing big data problems, and Bitcoin/blockchain for securing data and assets. But perhaps the most exciting software breakthroughs are happening in artificial intelligence (AI). AI has a long history of hype and disappointment. Alan Turing himself predicted that machines would be able to successfully imitate humans by the year 2000. However, there are good reasons to think that AI might now finally be entering a golden age. A lot of the excitement in AI has focused on deep learning, a machine learning technique that was popularized by a now famous 2012 Google project that used a giant cluster of computers to learn to identify cats in YouTube videos. Deep learning is a descendent of neural networks, a technology that dates back to the 1940s. It was brought back to life by a combination of factors, including new algorithms, cheap parallel computation, and the widespread availability of large data sets. It’s tempting to dismiss deep learning as another Silicon Valley buzzword. The excitement, however, is supported by impressive theoretical and real-world results. For example, the error rates for the winners of the ImageNet challenge — a popular machine vision contest — were in the 20–30% range prior to the use of deep learning. Using deep learning, the accuracy of the winning algorithms has steadily improved, and in 2015 surpassed human performance. Many of the papers, data sets, and software tools related to deep learning have been open sourced. This has had a democratizing effect, allowing individuals and small organizations to build powerful applications. WhatsApp was able to build a global messaging system that served 900M users with just 50 engineers, compared to the thousands of engineers that were needed for prior generations of messaging systems. This “WhatsApp effect” is now happening in AI. Software tools like Theano and TensorFlow, combined with cloud data centers for training, and inexpensive GPUs for deployment, allow small teams of engineers to build state-of-the-art AI systems. One of the first applications of deep learning released by a big tech company is the search function in Google Photos, which is shockingly smart. We’ll soon see significant upgrades to the intelligence of all sorts of products, including: voice assistants, search engines, chat bots, 3D scanners, language translators, automobiles, drones, medical imaging systems, and much more. Startups building AI products will need to stay laser focused on specific applications to compete against the big tech companies who have made AI a top priority. AI systems get better as more data is collected, which means it’s possible to create a virtuous flywheel of data network effects (more users → more data → better products → more users). The mapping startup Waze used data network effects to produce better maps than its vastly better capitalized competitors. Successful AI startups will follow a similar strategy. Cars. Big tech companies like Google, Apple, Uber, and Tesla are investing significant resources in autonomous cars. Semi-autonomous cars like the Tesla Model S are already publicly available and will improve quickly. Full autonomy will take longer but is probably not more than 5 years away. There already exist fully autonomous cars that are almost as good as human drivers. However, for cultural and regulatory reasons, fully autonomous cars will likely need to be significantly better than human drivers before they are widely permitted. Drones. Today’s consumer drones contain modern hardware (mostly smartphone components plus mechanical parts), but relatively simple software. In the near future, we’ll see drones that incorporate advanced computer vision and other AI to make them safer, easier to pilot, and more useful. Recreational videography will continue to be popular, but there will also be important commercial use cases. There are tens of millions of dangerous jobs that involve climbing buildings, towers, and other structures that can be performed much more safely and effectively using drones. Internet of Things. The obvious use cases for IoT devices are energy savings, security, and convenience. 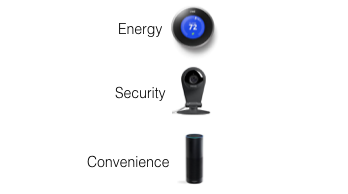 Nest and Dropcam are popular examples of the first two categories. One of the most interesting products in the convenience category is Amazon’s Echo. Most people think Echo is a gimmick until they try it and then they are surprised at how useful it is. It’s a great demo of how effective always-on voice can be as a user interface. It will be a while before we have bots with generalized intelligence that can carry on full conversations. But, as Echo shows, voice can succeed today in constrained contexts. Language understanding should improve quickly as recent breakthroughs in deep learning make their way into production devices. IoT will also be adopted in business contexts. For example, devices with sensors and network connections are extremely useful for monitoring industrial equipment. Wearables. Today’s wearable computers are constrained along multiple dimensions, including battery, communications, and processing. The ones that have succeeded have focused on narrow applications like fitness monitoring. As hardware components continue to improve, wearables will support rich applications the way smartphones do, unlocking a wide range of new applications. As with IoT, voice will probably be the main user interface. Virtual Reality. 2016 is an exciting year for VR: the launch of the Oculus Rift and HTC/Valve Vive (and, possibly, the Sony Playstation VR), means that comfortable and immersive VR systems will finally be publicly available. 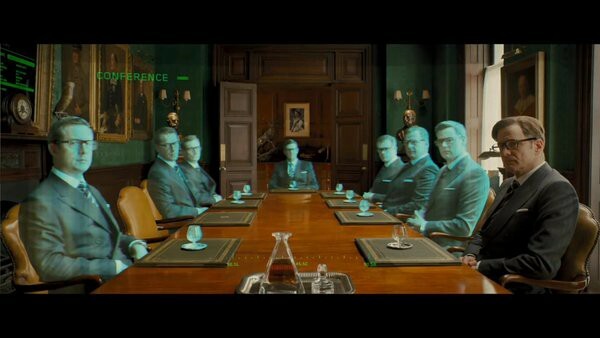 VR systems need to be really good to avoid the “uncanny valley” trap. Proper VR requires special screens (high resolution, high refresh rate, low persistence), powerful graphics cards, and the ability to track the precise position of the user (previously released VR systems could only track the rotation of the user’s head). This year, the public will for the first time get to experience what is known as “presence” — when your senses are sufficiently tricked that you feel fully transported into the virtual world. VR headsets will continue to improve and get more affordable. Major areas of research will include: 1) new tools for creating rendered and/or filmed VR content, 2) machine vision for tracking and scanning directly from phones and headsets, and 3) distributed back-end systems for hosting large virtual environments. Augmented Reality. AR will likely arrive after VR because AR requires most of what VR requires plus additional new technologies. For example, AR requires advanced, low-latency machine vision in order to convincingly combine real and virtual objects in the same interactive scene. It is possible that the pattern of 10–15 year computing cycles has ended and mobile is the final era. It is also possible the next era won’t arrive for a while, or that only a subset of the new computing categories discussed above will end up being important. I tend to think we are on the cusp of not one but multiple new eras. The “peace dividend of the smartphone war” created a Cambrian explosion of new devices, and developments in software, especially AI, will make those devices smart and useful. Many of the futuristic technologies discussed above exist today, and will be broadly accessible in the near future. Observers have noted that many of these new devices are in their “awkward adolescence.” That is because they are in their gestation phase. Like PCs in the 70s, the internet in the 80s, and smartphones in the early 2000s, we are seeing pieces of a future that isn’t quite here. But the future is coming: markets go up and down, and excitement ebbs and flows, but computing technology marches steadily forward.